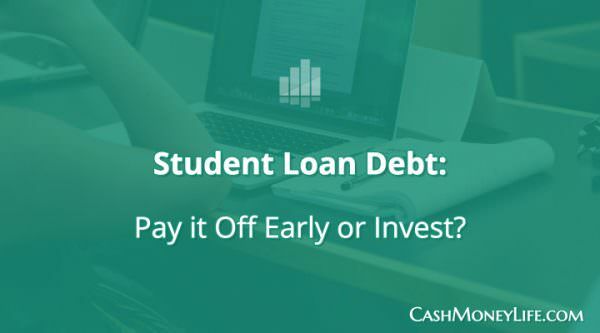 Home / Loans / Student / Should You Invest While Paying Off Student Loan Debt? Should You Invest While Paying Off Student Loan Debt? Student loan debt has become a pervasive problem across the country. Statistics indicate that 40 million people collectively owe more than $1.2 trillion in student loan debt. Worse, well over 1 million graduates are being added to the ranks of those with student loan debt each year. That presents a problem on a number of fronts. Student loan debts themselves can be a serious burden, particularly on high balance debts, such as those exceeding $50,000 or $100,000. But it’s not just the loans themselves, or the amount owed, that are the problem. There’s also the fact that student loan debts are keeping a lot of young people financially stuck at a time in life when they need to be making rapid forward progress. For example, if you have student loan debt, should you also invest money while you are trying to pay off the debts? Because of the time value of money, it’s important to begin investing money early in life. The years that you do not invest in your 20s and 30s represents time – and investment returns – that you can never get back. Let’s consider the benefits – and drawbacks – of three different strategies that you can consider in balancing investing and paying off your student loan debts. Let’s consider both sides of a concentrated effort to use all of your financial resources to pay off your student loan debt as soon as possible. That means that you will not put money into investments at all until the loan is fully paid. Now let’s take a look at the opposite strategy. Here you will concentrate all of your extra financial resources on investing for the future. As far as your student loan debts, you will simply make the minimum monthly payments for as many years as it will take to pay off the debt. Focusing on both goals at once brings balance your financial situation. But depending on your individual circumstances, it could be a tight squeeze. You may wish to invest with your employer sponsored 401k plan if your employer offers a matching contribution. This is a good opportunity to increase your retirement savings with little effort on your part. Some individuals will invest up to their employer match to take advantage of this free money. They then direct the rest of their extra cash flow toward paying off student loans. In a perfect world, you would choose paying off your student loan debt and investing at the same time. And of course, if you have sufficient income to attack both goals at once, and still have enough money to live on comfortably, that’s probably the route you should take. It introduces balance in your financial situation, that will give you a greater sense of control over the whole process. But if you don’t have the income to tackle both at once, you’ll have to play divide and conquer. Choose the goal that is most important to you, that is likely to have the biggest positive impact in the least amount of time. If the monthly payment on your student loan debt is particularly large in comparison to your income, concentrating on paying off the debt may be the only logical choice. Until you do, you simply won’t have the money necessary to invest. But if you are comfortable with the monthly payments, and prefer to invest, with the idea that building up long-term financial security is more important, then have at it. Just be sure that you are okay with carrying the student loan debt for a very long time. There’s no one correct answer here, that’s why we’ve taken a close look at all three. Choose whichever strategy that you think will work best for you. Pay off student loan debt before you invest. That’s my rule. Step 2: List all loans SMALLEST to LARGEST, and Pay off THE SMALLEST FIRST. Then, you snowball the payment (once paid off) into the next biggest, creating a SNOWBALL EFFECT. Step 3: Save 3-6 months of monthly expenses and at the same time, lower them! Cut car insurance to $25/month (check InsurancePanda), cut gas to less than $50/month (check Gasbuddy), get rid of cable TV (check netflix), and look to TMobile for cellphone ($20/month). Step 5: Save for something big, like your KIDS’ college savings (at 12%, accounting for inflation rate). Step 6: Pay off the house (if you have one), or your credit cards. Be careful of getting into more debt!